EcayOnline is the most recognized online gateway to the Cayman Islands and its business community. Local residents and Internet users all over the world have access 24 hours a day, 7 days a week to an unparalleled wealth of information at the click of a mouse or the swipe of a finger! This EcayOnline website enjoys a huge amount of traffic from Cayman residents and overseas investors, visitors and those thinking about moving to Cayman. Many businesses (hundreds of them!!) benefit from partnering with Ecay to assist in their marketing and promotions - you can view testimonials on our homepage. 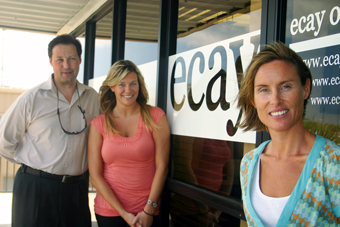 Ecay Online is the perfect addition to your marketing mix, give the sales team (1 of whom is pictured, the other 2 left but we like to remember them and hope one day they'll return) a call today and let your company be one of Cayman’s market leaders , riding on the back of the Ecay success story. Click thru below, or call (345) 947-3229 now!